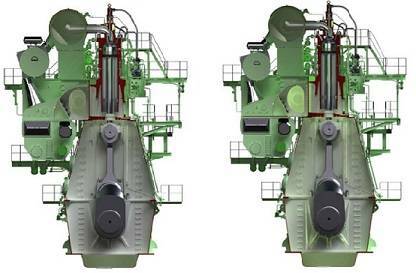 Following from the market development towards the further optimization of large container ships’ propulsion efficiency, MAN Diesel & Turbo has announced two significant additions to its engine program. The G95ME-C9.2 and S90ME-C10.2 units rank among the largest and most powerful engines the company has ever released to the marine, two-stroke market. The company reports that the drawing delivery time for the S90ME-C10.2 and G95ME-C9.2 is, respectively, two-four months and nine-11 months after placing a firm order, facilitating the consideration of the engines for projects currently in planning stages. 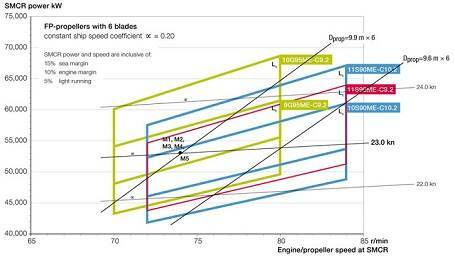 As can be seen in Figure 1, different alternatives for different layouts – in respect to design speed – can be achieved by the two engine types. As can also be seen, the S90ME-C9.2 can be made available from 72-84 rpm, that is, the layout diagram of the S90ME-C9.2 can be extended from the current L3-L4 speed of 76 rpm down to 72 rpm if so required for projects. This extension of the layout diagram requires no change to the S90ME-C9.2 basic engine design. The S90ME-C10.2 is similar to the well-known S90ME-C9.2 in that all outline dimensions are identical, including footprints. 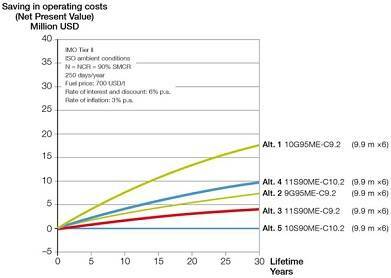 Any design differences are related to the increase in the mean effective pressure, leading to modifications of the crankshaft journal bearing design and web thickness, and including an adaptive modification to the connecting rod. 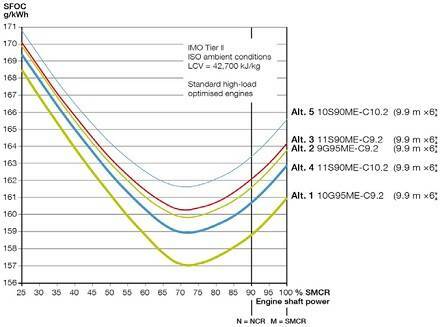 Minor differences in the size and number of, for instance, turbochargers and hydraulic pumps for the Hydraulic Power Supply (HPS) follow normal power/rpm output rules.